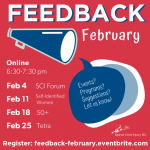 It’s SCI BC’s Feedback February! We have a lot of really great programming coming your way this year – so we want to hear from you! If you are an individual with Tetraplegia (Quadreplegia), you are invited to our feedback session on Tetraplegia Programming, taking place Monday, February 25th 6:30-7:30pm. To attend, please make sure to RSVP here. Not able to attend at this particular time, but still want to give us your feedback? Please feel free to email our new Provincial Peer Program Lead, Jenna at jwright@sci-bc.ca.